The Martinelli Luce Pipistrello table lamp was used as a prop in the 2017 film Overdrive. Overdrive is an action thriller film directed by Antonio Negret. The Martinelli Luce Pipistrello table lamp was also used as a prop in the 2017 film Jour J (alternative titel: Wedding Unplanned). Jour J is a French comedy film directed by Reem Kherici. The Martinelli Luce Pipistrello table lamp was also used as a prop in the 2018 film Gaston Lagaffe. A movie made after the gag-a-day comic strip created in 1957 by the Belgian cartoonist André Franquin. The Martinelli Luce Pipistrello table lamp appears in an advertisement for Resi, a Belgian brand of frying fat produced by Vandemoortele. 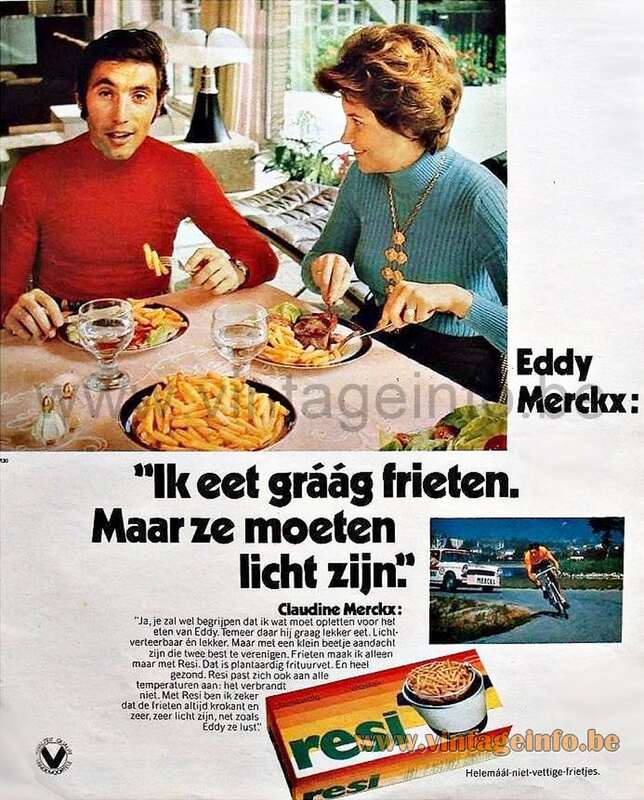 The photo was taken at the home of famous bicycle racer Eddy Merckx in the 1970s. Eddy Merckx is still the proud owner of this table lamp. Here together with his wife in the picture. Materials: Painted metal. Telescopic stainless steel stem. 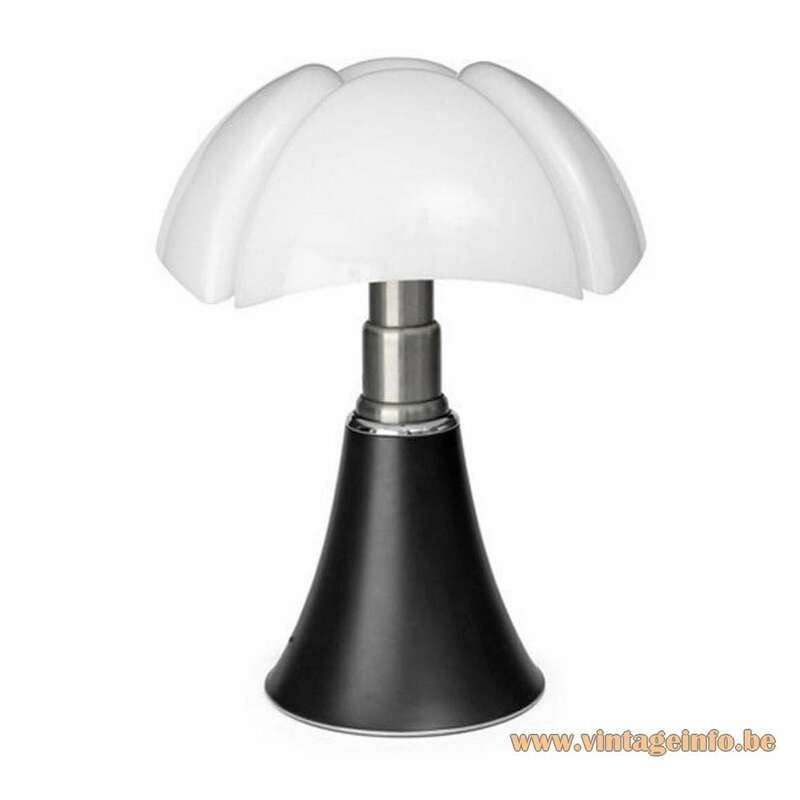 White acrylic lampshade. Some metal parts. Bakelite sockets. Any type of light bulb with an E14 screw base can be used, not a specific one preferred. 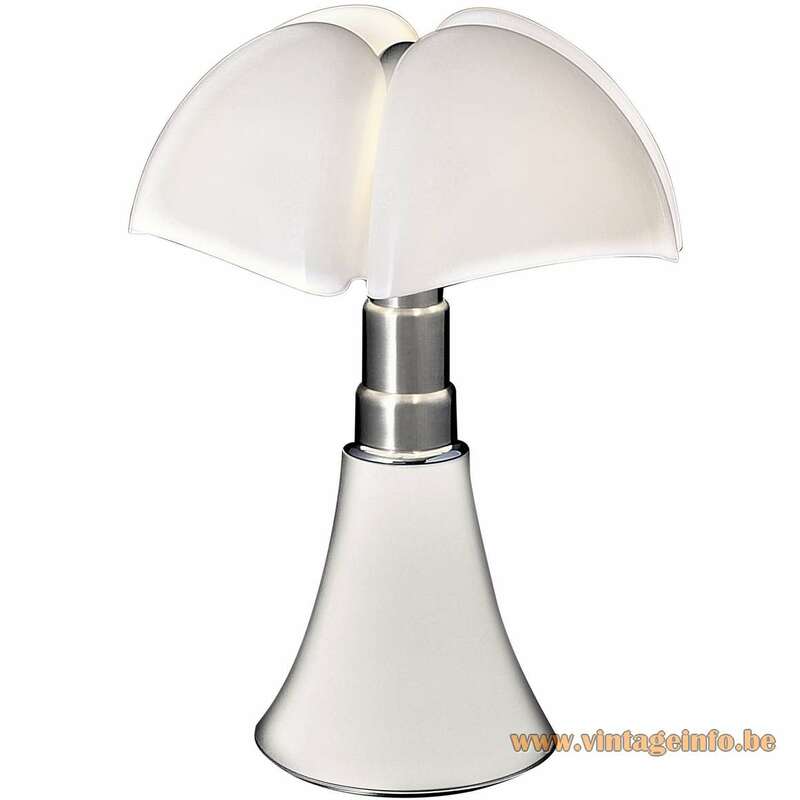 Today available in LED but it uses E14 sockets (4 x 5 watt). Designer: Gae Aulenti (1927 – 2012) in 1965. Manufacturer: Martinelli Luce S.P.A. (Società per azioni – Joint-stock company), Via Santa Lucia, 9, 55100 Lucca, Italy. Some 80 km (50 miles) away from Florence and 20 km (13 miles) from Pisa. 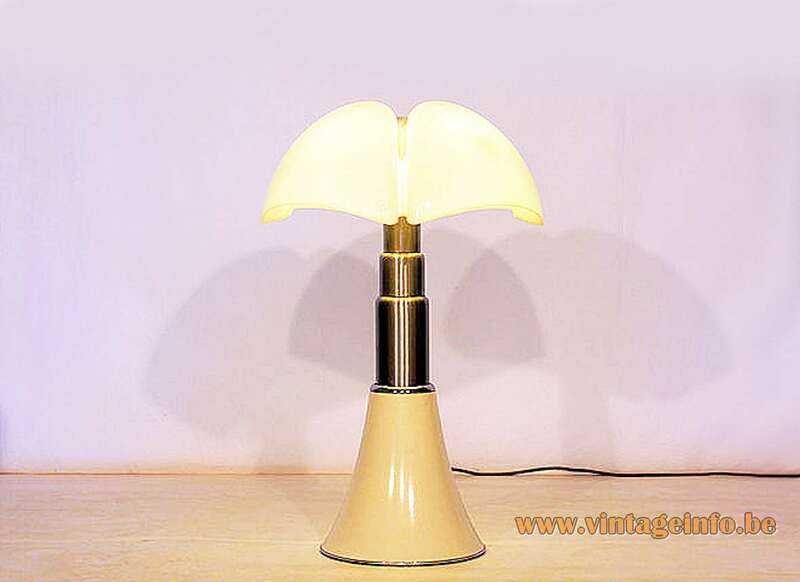 Other versions: Over the years these lamps were made in many colours. Today (2018) available in 5 colours: dark brown, white, purple red, glossy black, satin aluminium. 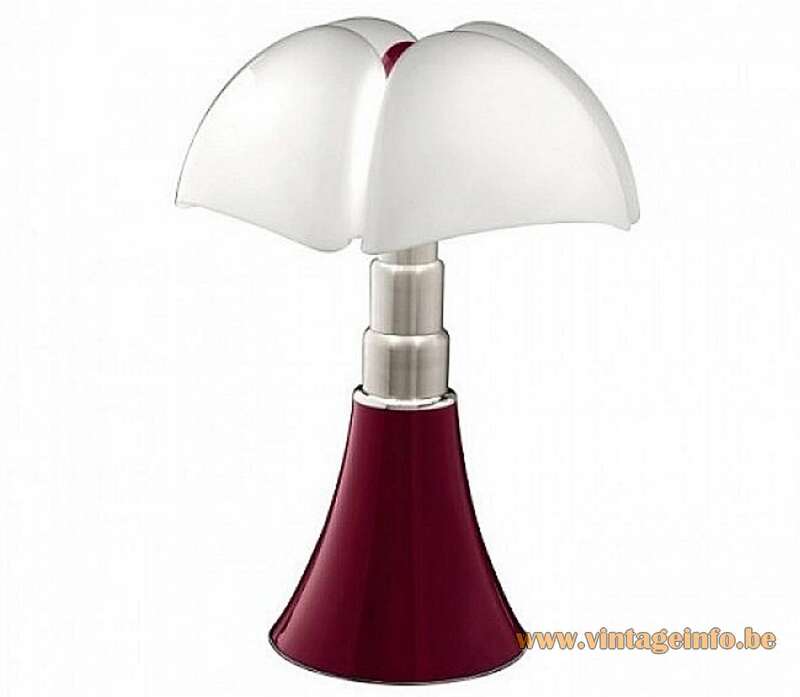 4 different lamps exist: This lamp, a medium size lamp , the Pipisterello Med, the Minipipistrello and the cordless version of the Minipipistrello. Pipistrello: Italian word for bat. Gae Aulenti, born 4 December 1927 as Gaetana Aulenti in Palazzolo dello Stella, Italy, some 90 km (56 miles) from Venice. She studied to be an architect at the Milan School of Architecture of the Polytechnic University (Politecnico di Milano), and graduated in 1954. Gae Aulenti began her career as an architect and freelance designer. She designed many interior designs and furniture for companies such as Fiat, Pirelli, Olivetti, Knoll International, Ideal Standard, Zanotta and Louis Vuitton. 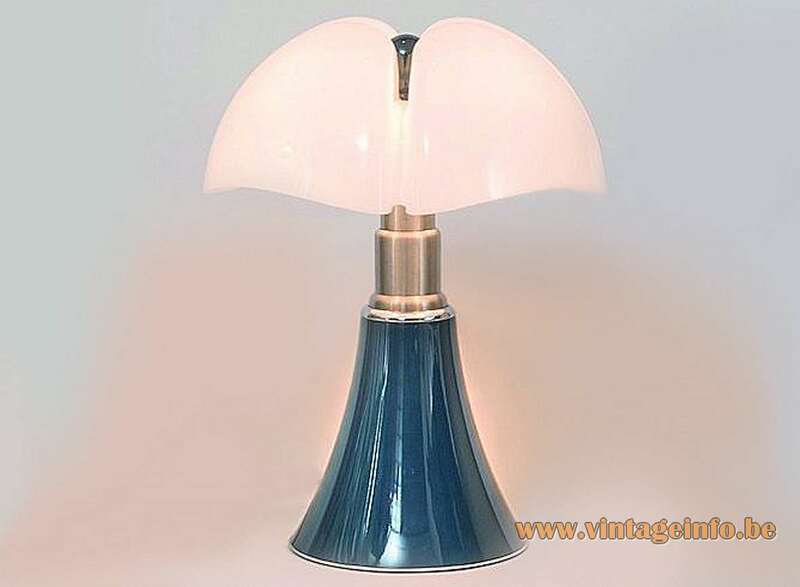 Gae Aulenti designed lamps for among others: Artemide, Vistosi, Candle, Fontana Arte, iGuzzini, Poltronova, Stilnovo and of course Martinelli Luce. 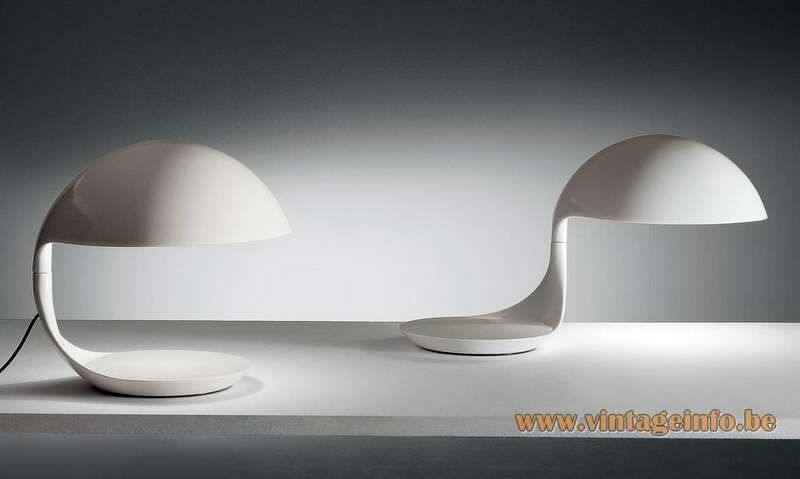 She also designed the Ruspa table lamp in 1968 for Martinelli Luce, as you can see on the left. 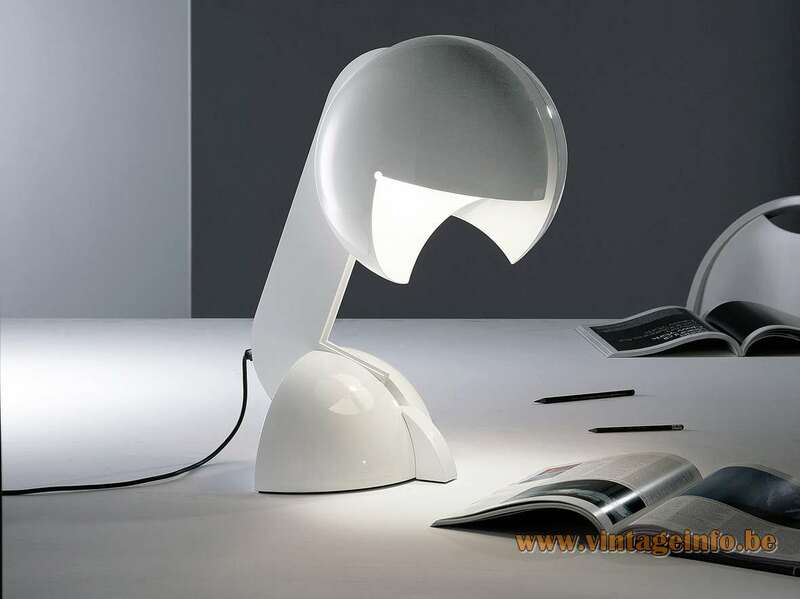 Another table lamp that is still in production (2018). The Harvey Guzzini Quadrifoglio is not a design by Gae Aulenti. It is published wrong in books. Gae Aulenti started to work for the iGuzzini company in 1985 and created together with Piero Castiglioni the (industrial) Cestello lamp for the Palazzo Grassi in Venice, Italy; 17 years after the Quadrofoglio was designed by Studio 6G, the Harvey Guzzini design-team. Aulenti received many awards for her designs and she is seen as one of the greatest Italian designers after World War II. Gae Aulenti died in Milan on 31 October 2012, she was 84. 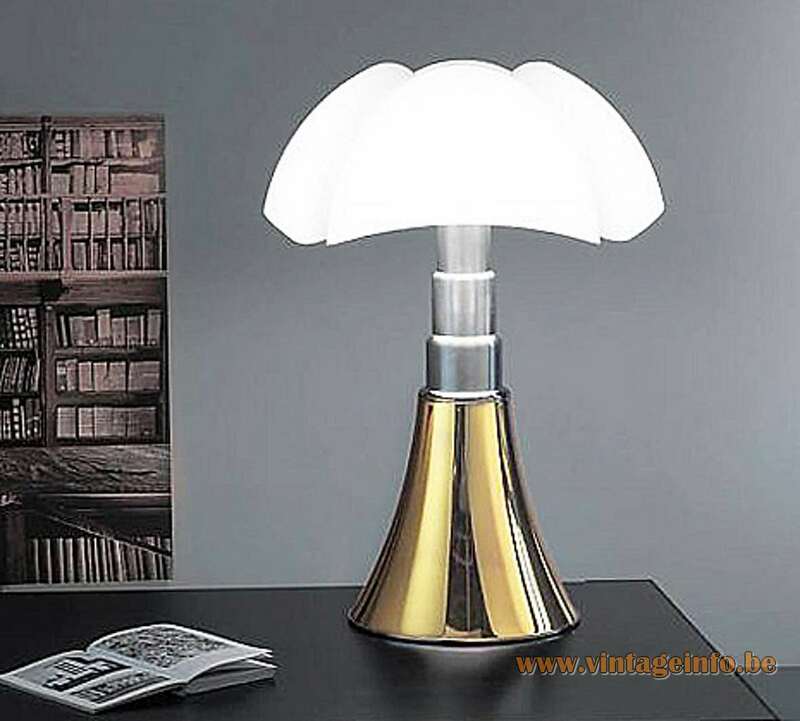 Martinelli Luce was founded in 1950 by Elio Martinelli. He focused originally on interior design and on lamps for retail outlets, hotels, restaurants, and public houses. Designers that worked for the company: Adolini+Simonini Associati, Gae Aulenti, Sergio Asti, Michel Bouquillon, Marco De Santi – Studio Natural, Angelo Micheli, Studio Orlandini, Luc Ramael, Karim Rashid, Marc Sadler, Studio Lucchi & Biserni, Brian Sironi, Studio 4P1B and many others. Elio Martinelli was born in Lucca, Tuscany in 1921. He studied as a set designer at the Institute of Fine Arts in Florence. At first he worked for his father’s business within the lighting sector. 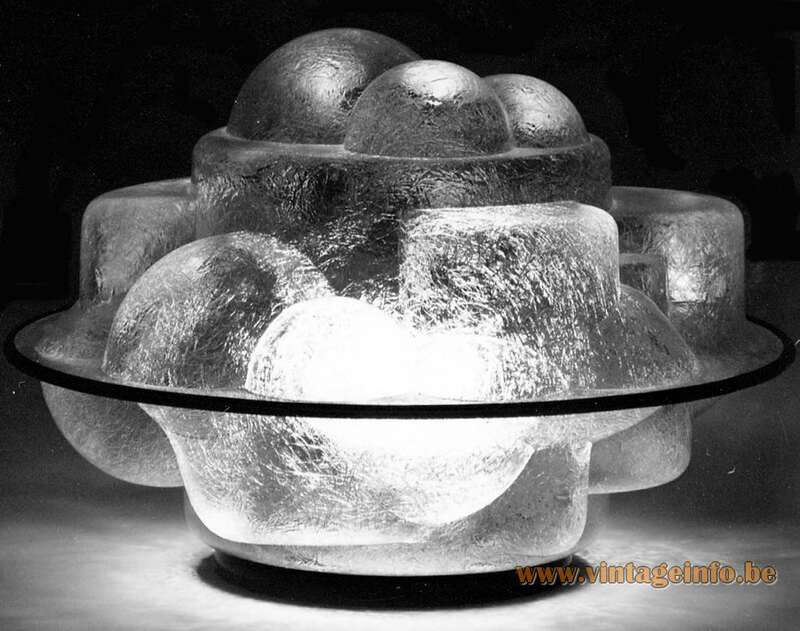 Soon he began designing and installing his own lighting systems what resulted in the founding of his own company Martinelli Luce in 1950. 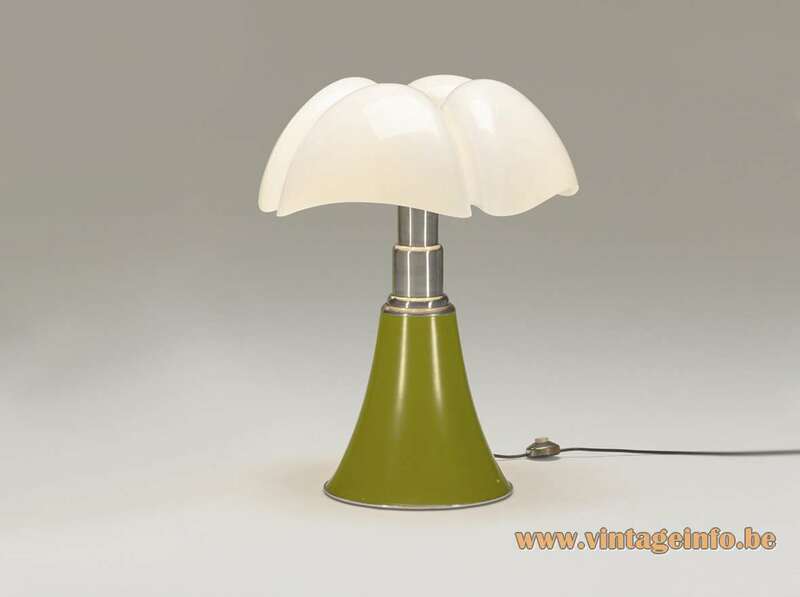 Elio Martinelli designed many famous lamps, many of them are still in production. The Biconica (1987), Duemiladuecentocinquanta (2250 in Italian – 1986), Le Rondini (1984), Foglia (1969), Cono (1980), Blow (1980), Out (1984), Tube (1977), Poliedro (1962), Flex (1969), Gomito (1974), Nuvole Vagabonde (1999), Serpente (1965), Elmetto (1976) and the Cobra (as you can see on the left, in 1968), to name the most important. His works are on display in many design museums around the world. Martinelli worked until his dead in 2004 for the company. Sergio Asti was born in Milan, Italy in 1926. He studied at the same school as Gae Aulenti, the Politecnico di Milano (Milan School of Architecture of the Polytechnic University). After graduating in Architecture in 1953, he spent five years as Assistant Professor of Interior Design. He is one of the founders of the ADI, the Associazione per il Disegno Industriale (Association for Industrial Design). Many objects designed by Sergio Asti are present in the collections of the most important museums around the world and he received numerous awards. 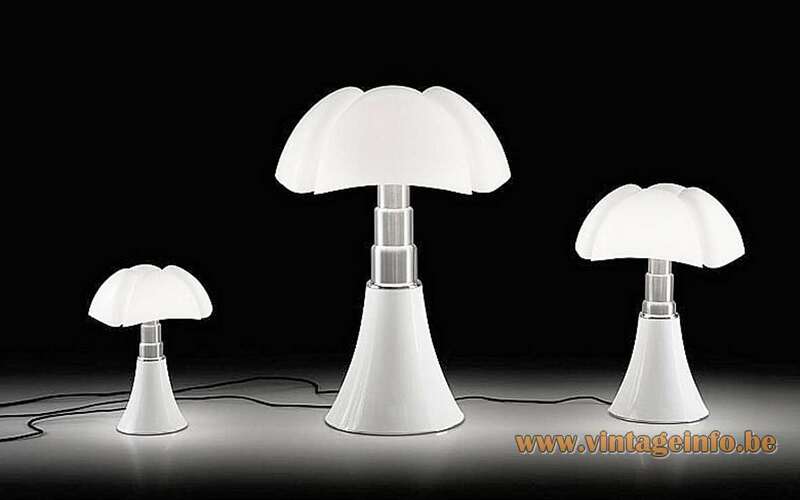 He designed lamps for Artemide, Candle, FontanaArte, Raak, Knoll International, Arteluce, Kartell, Bilumen, C.I.L. Roma, Poltronova, Martinelli Luce and several others. In 2018 still in production by Martinelli Luce: the Scafandro table lamp and the Profiterole table lamp, as you can see on the left. Many thanks to Martinelli Luce and Chicca Manca – CeG Maxicom for the information and photo’s. Many thanks to Steven for the Resi advertisement scan. Many thanks to Colin for the pictures of the films.